A big thanks to Tony's Chocolonely UK for sending me some bars from their newly launched UK range to review recently. They have quite an impressive assortment indeed and more impressive still is the annual report booklet on their fair trade mission, that they sent along with the chocolates. I haven't read it fully yet but am very keen to do so! I firmly believe ethical chocolate is the way forward, in fact it's the only way forward if we are to continue enjoying the treat. 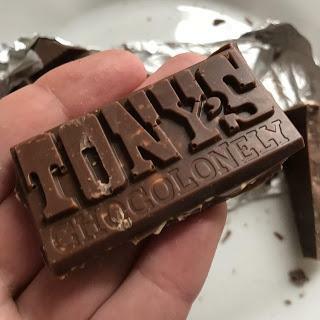 Tony's are on a mission to make it the norm - so bravo to them and to help in their mission you can spread the word about their tasty chocolates! First up for review is this Almond & Honey Nougat Milk Chocolate, their take on that classic combination otherwise known as Toberone. The ingredients are pretty similar to Toblerone but of course the chocolate is better quality - Belgian fairtrade Chocolate with 32% cocoa solids, with almond and honey nougat pieces. I do love the bar design - it's haphazard, chunky, and with different size pieces in a similar way that Cadbury Marvellous Creations used to be. My fave piece is the Tony's logo which breaks off into a nice mini block. The filling doesn't skimp at all - there's plenty of it embedded in the thick chocolate! The chocolate itself is good quality, with a nice cocoa flavour that melts in the mouth with a smooth finish. It's a step up from any regular mainstream stuff. 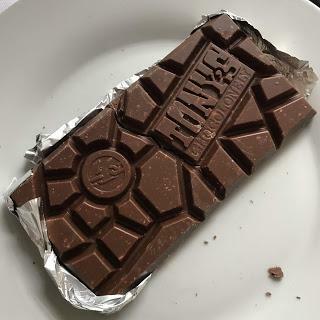 The filling is of course crunchy and sweet, not as sweet as Toblerone and for that I think it's much better. 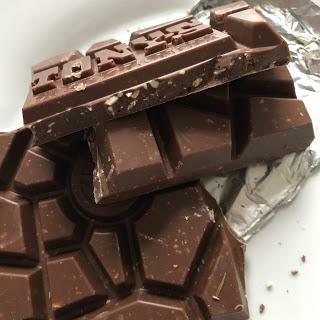 It's basically better quality Toblerone in an easier to eat format. The almonds taste fresh and crisp. I really enjoyed this and out of all the bars I was sent it was amongst my favourites - although it can't beat the salted caramel! 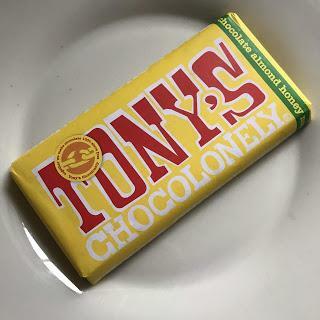 All in all - I am so pleased that Tony's have brought their range to the UK, proving that you can have ethical Chocolate that tastes great and is even quirky thanks to the unique block design. I've heard a lot of good comments about the range on Instagram and I can certainly see why! To buy their bars you can check out Selfridges, Waitrose, Whole Foods Market, and their online store. They will also be launched into Sainsbury's stores this month. The larger 180g bars retail at £3.99 whilst there's 4 smaller 50g varieties for £1.69.It might sound a lot but remember you're paying for good quality chocolate that has been made in an ethical way. Worth it in my opinion!